Boston University, November 16th, 2018. 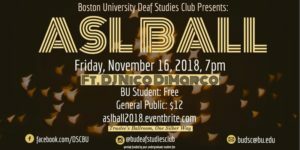 Boston University Deaf Studies Club annual ASL Ball offers the Deaf Community and BU community come together to celebrate and get to know each other. There will be food, music, games and raffles. * An opportunity to practice ASL and have fun. * Special guest DJ: DJ Nico DiMarco. BU Student: Free – *Please note: BU Student tickets are ONLY for Boston University Students. BU Student IDs will be checked at the door. * No minimum age requirement nor age limit – everyone is welcome, both non-students and non-users of American Sign Language.